← Finding Dory will be swimming into theaters on June 17th, 2016!! The holidays are quickly approaching, and as excited as I am about being thankful, the twinkling lights, the presents under the tree, the cheer and merriment, I’m also sad because this is the first year that neither my grandfather or grandmother won’t be with us. As the years pass and our elders leave us, one really appreciates how important loved ones are, and how wonderful it is to spend time with them while they are alive. That goes for family as well as friends. That’s why I love filling my home with people, there’s nothing like spending the holidays with those you love. While our family dinners for Thanksgiving and Noche Buena are hosted by my Tio on my mom’s side, and my Tia on my dad’s side, respectively, I am the hostess for Friendsgiving, as well as the Christmas exchange among our friends. I love having family and friends over, and being a good hostess is important to me. There’s always plenty of food and drinks, and of course plenty of amenities for my guests. Asi me enseño mi abuela. I recently had to go to BJ’s, so I decided to stock up for our holiday gatherings a little early. 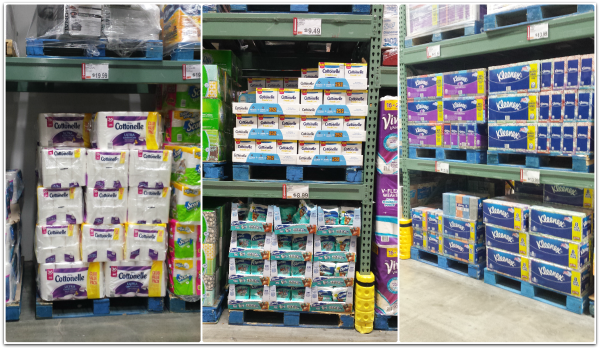 I purchased Cottonelle toilet paper, Cottonelle flushable cleansing cloths, and Kleenex tissue. The items where easy to find, right in the paper goods aisle. 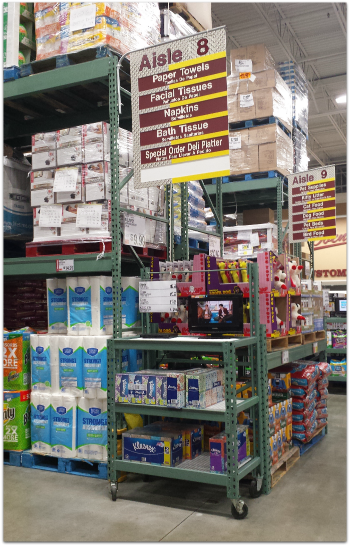 This Kleenex end cap display was pretty helpful too. Buying in bulk means I won’t end up running out in the middle of our parties, and having plenty of essentials in stock means I can focus on the other items on my party planning to-do list. I’ll be taking a couple of boxes of Kleenex to my Tio‘s house on Thanksgiving, as I’m sure lots of tears will be shed as we think about our departed family members. The rest I’ll keep at home, not only because I have allergies year round (and some of my guests are prone to allergies too), but also because cooler weather means cold and flu season, and if my friends are feeling under the weather there will be plenty of tissue on hand. Our guest bathroom is already fully-stocked, ready for those who visit us. In the basket above the toilet are my boys’ toiletries and Cottonelle flushable wipes for our guests. Inside the bathroom cabinet there’s plenty of toilet paper in stock. My party planning list got a little shorter with this recent trip to BJ’s. How are you preparing for the holidays? Will you be hosting any holiday gatherings in your home? This entry was posted in Deals and Discounts, Giveaways, Home Sweet Home. Bookmark the permalink.